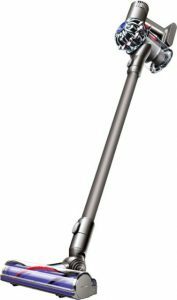 Best Buy has the Dyson V6 Animal Cord-Free Stick Vacuum for $199.99 today as their Deal of the Day – save $80. Leave no dirt or pet dander behind with this Dyson Animal cordless vacuum. Its direct-drive cleaner head runs the bristles to deeply clean carpets, and its mini motorized tool lets you clean upholstery and crevices in handheld mode. This versatile Dyson Animal cordless vacuum works on hard floors and ceilings for all-around performance.